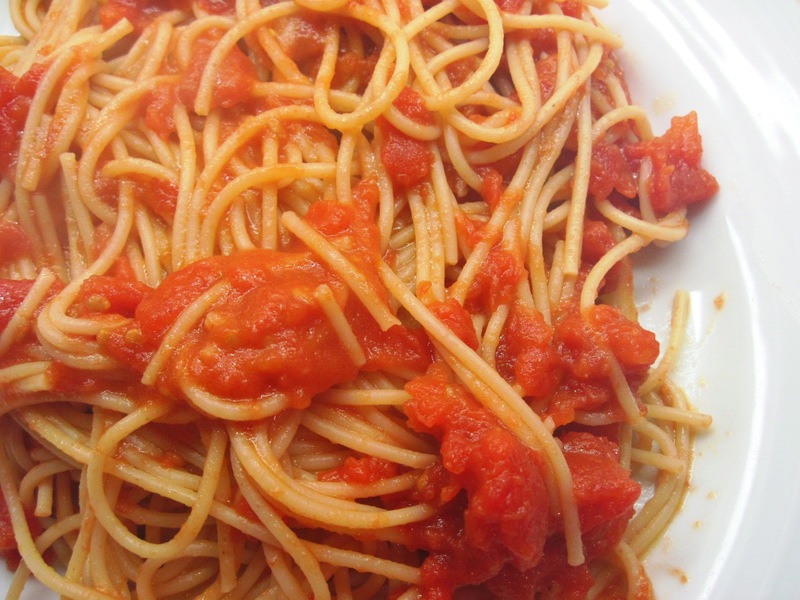 Both Marcella Hazan (Essentials of Classic Italian Cooking) and her son, Giuliano Hazan (The Classic Pasta Cookbook), have recipes for Sugo al Burro e Pomodoro (Butter and Tomato Sauce). It has been a family favorite of theirs for years. It’s Italian comfort food! The flavor is pure and it’s a very simple sauce for pasta. I used spaghetti, but it would be a perfect sauce for gnocchi or homemade tortellini. 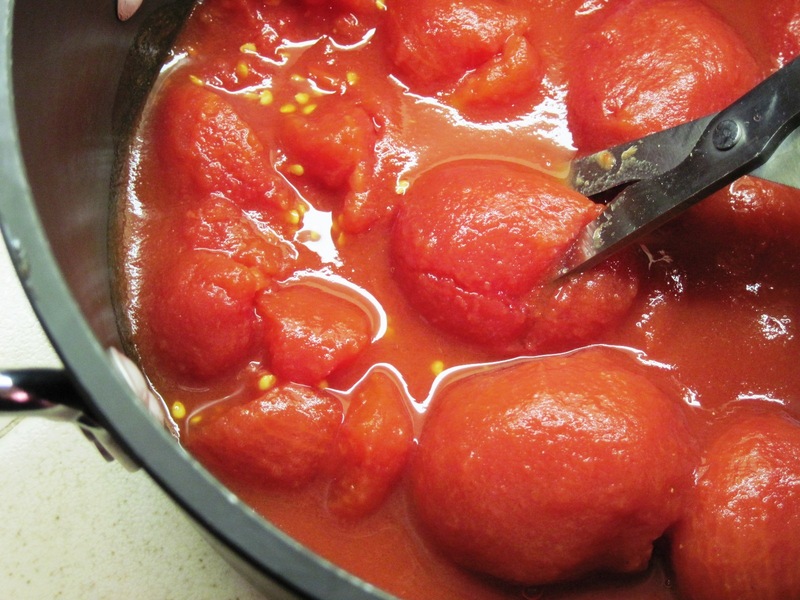 Giuliano calls for 2 pounds of peeled and seeded plum tomatoes or 3 cups peeled canned tomatoes. (Don’t use fresh tomatoes unless they are in season and flavorful. Canned is better this time of year.) I used a 28-ounce can of San Marzano tomatoes. I don’t mind seeing the tomato seeds in the finished sauce so I didn’t bother to seed them. The recipe calls for a medium onion; my onion was huge, so I used just half of it instead of the whole thing. (Next time I may try using the whole onion, even if it is large.) Both Marcella and Giuliano suggest tossing the onion halves when the sauce is done. Bob was shocked; he enjoyed eating them! Put everything in a pan and simmer, uncovered, over low heat. 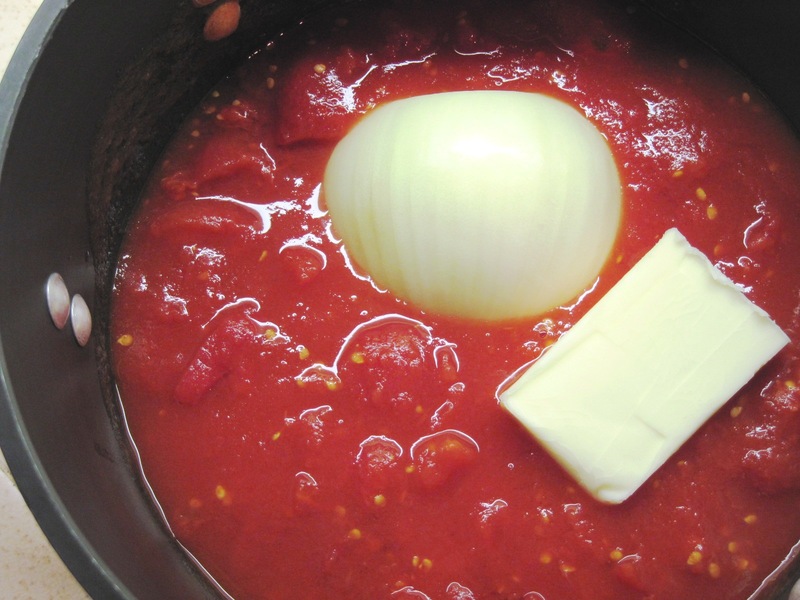 Cook for about 45 minutes, until the tomatoes are reduced and you can see that the butter has separated out. Toss with hot pasta and serve with Parmesan cheese to grate at the table. I saw something similar to this on Smitten Kitchen the other day, but have been hesitant to try it because it seems like the butter makes a healthy-ish dish…well, not very healthy 😉 But if it’s really good, maybe we should try it! I saw the post on Smitten Kitchen, too. After she raved about it, I decided to try it, too! It does seem like a lot of butter, but there’s no other fat in the recipe and the butter’s spread out over 4 – 8 servings. You could always use a bit less butter. 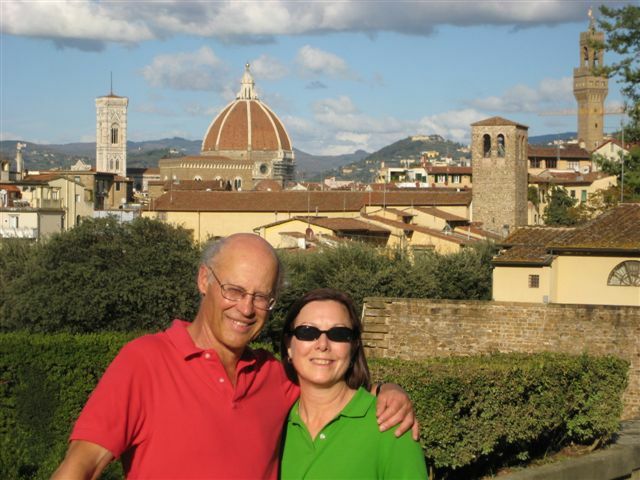 Giuliano Hazan’s recipe called for 6 tablespoons of butter for 3 cups canned tomatoes; Marcella’s called for 5 tablespoons for 2 cups canned tomatoes. I think a 28 oz. can is closer to 3 cups so I went with 6 tablespoons. This looks nice. I love the way Italian cooks take a few simple ingredients and coax out the most amazing pure tastes. Thanks for sharing. this is not the italian way of cooking spaghetti with sauce…maybe it’s an italian/american dish like spaghetti with meat balls.